It’s Great American Cleanup Season here in Mississippi! (See Gov. Phil Bryant’s proclamation.) Volunteers across the state are picking up litter, planting trees and shrubs and improving their communities. It’s official! Gov. 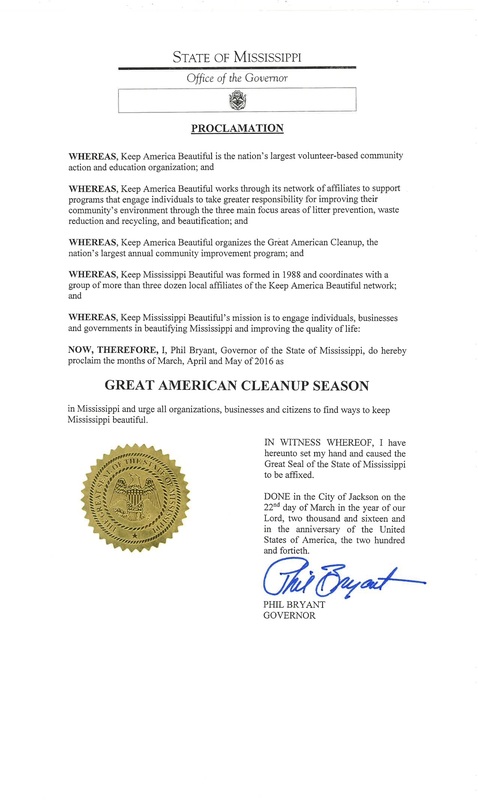 Phil Bryant issued a proclamation that it’s officially Great American Cleanup Season in Mississippi. Join an event near you. Find a Keep Mississippi Beautiful affiliate in your area or see what we have planned on our calendar. Host a Great American Cleanup event in your area. Download the Great American Cleanup Request Form 2016 for garbage bags and other supplies. Share how you’re cleaning and greening on social media. Use the #GAC2016 and #CleanGreenMS hashtags. Be sure to check out our Great American Cleanup Social Media Hub to see what Mississippians are up to!